The previous chamber to barrel ratio test using the miniL1 provided us with valuable data in respect to the volume of the chamber versus the volume of the barrel. The test demonstrated that there is in fact one certain barrel size which would provide the fastest shot when used with a fixed volume combustion chamber. What was not known was if this fastest C:B ratio would scale up to a full sized launcher using a 1.5" barrel or how friction from using different ammo would affect the results. Our new C:B test was set up to answer some of these questions. This test was done with the full sized L1 launcher and used a newly developed 1.5" gasket slug as well as off the shelf russet potatos as test ammunition. The barrel for this test was high quality, 1.5" sch. 40 PVC. Three 10 foot lengths were joined together with modified 1.5" SxS connectors to form a virtually seamless 30 foot barrel. This barrel was incrementally cut down to measurements that would correlate with standard C:B descriptions. The 30'x1.5" barrel and 2600cc chamber produce a .22:1 C:B ratio but cuts were made at .3:1, .4:1, .5:1, .6:1, etc. The gasket slug was first developed for the miniL1 C:B test and exhibited excellent performance and consistency. The design was simply scaled up to 1.5" and uses the same hi density neoprene gasket as the original. 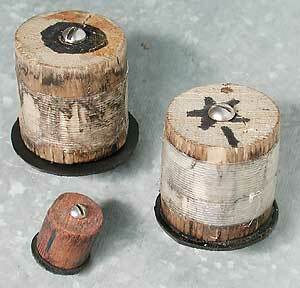 The 1.5" diameter wooden dowel fits loosely inside the barrels 1.6" diameter. The 1.5" slug on the left split during preliminary testing and was put back together with glue and stranded tape. It is shown with the original 1.75" diameter gasket. The slug on the right with a star on top is the actual slug used in this test and is shown with one of the finalized 1.69" gaskets. It was taped before being shot and survived the whole ordeal without splitting. The original 3/4" gasket slug is shown for comparison. The breech end barrel knife on our test barrel was cut off to eliminate any chance of the pressure not funneling properly out of the chamber through the barrel. This flush fitting end also brings the L1 launcher back to it's measured chamber volume of 2600cc. A slug cutter was used to breech load potatoes into the knifeless barrels. Gasket slugs load quickly without any fuss or mess. The rubber seal makes an audible pop as it clears the breech to form a tight seal. The slug pictured here uses the original 1.75" gasket which would curve back like a bell then deform forward upon launch. 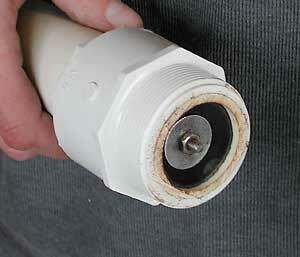 The extra rubber would find its' way in between the slug and barrel wall increasing friction and residue. 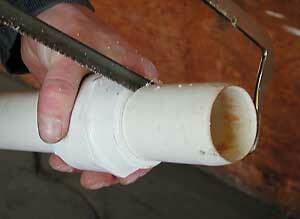 The 1.69" gaskets prevented this deformation and also reduced rubber deposits inside the barrel. The "tarp and bucket" backstop was created to safely catch the delicate gasket slugs which would be coming in at over 400 MPH. A 5 gallon paint bucket is filled tight with high strength plastic wrap. 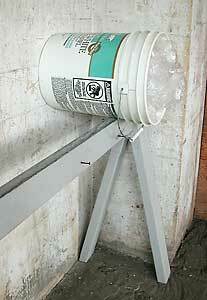 The bucket is positioned horizontally with the bottom of the bucket placed squarely against a wall. Upon impact, the bucket would flip and fall, usually knocking the sawhorse over. The chronograph was placed out of reach of this flying debris. A separate bucket filled with old clothes and plastic wrap was used to catch the potatos. The plastic wrap worked great with spuds and prevented starch from flying directly back at the chronograph and shooter. 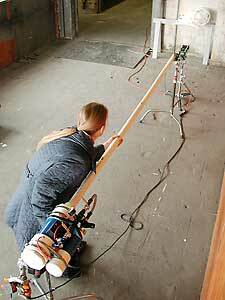 Numerous preliminary trials were done to ensure the final C:B test would run smoothly. We were able to fine tune gasket slug performance while checking the reliability of our backstop. Notes were kept on everything to ensure that nothing would be forgotten. The notes from the day pictured here included one specific item, earplugs. The image to the right shows a first generation 1.5" slug caught in the plastic wrap. 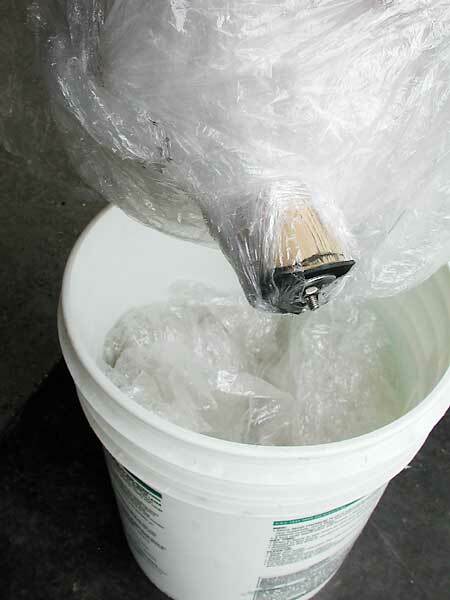 This type of plastic wrap is unbelievably strong and almost impossible to tear by hand. This slug used the old style 1.75" gasket and no tape and clearly shows where the rubber was pinched between the barrel wall and the slug itself.